The Bill Williams book on Austin 7 Specials notes: “for simple general purpose layout with adequate performance, there is very little to beat the single downdraft carburettor. Many well know Austin Specials have performed most creditably with a downdraft Zenith carburettor as fitted to the Sports engines”. The Nippy and Speedy utilised the 30VE1 (note its a ‘1’ not an ‘I’) which is difficult to find and expensive. The following gives some of the variants used successfully with some adaption to the jets to provide the same settings. It should be noted that the Nippy settings were over-choked in relation to the engine size, so some sort of magic occurred. Can anyone throw light on this? Jack French refers to Simplicity racing on a 19mm choke; conversely he also refers to 22mm being a theoretical perfect figure. If Venturi size = 20 x Square root of (swept volume of one cylinder/1000 x required revs/1000), that yields 20 x root(186.75/1000 x 5000/1000) = 19.325mm. The choke on the Nippy was 21mm; on the Speedy 25mm. Choke, Main and Comp. jets all differ across the above three 30VE1 type carbs; the important fact to establish is the C.S. Number of any 30VE1 offered for sale. 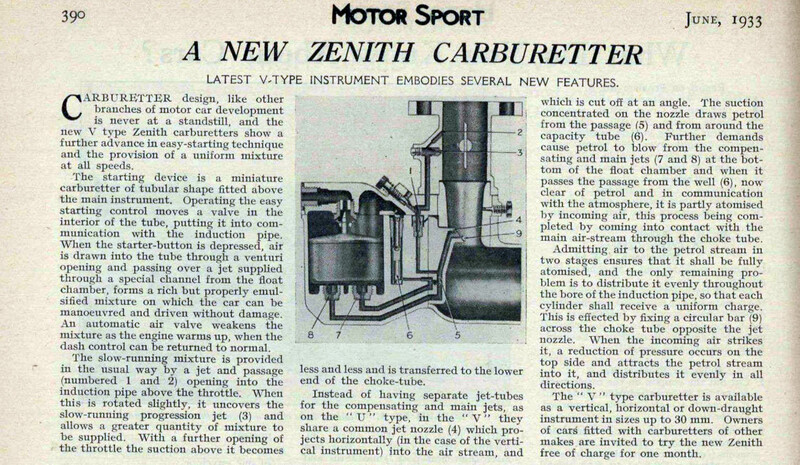 Zenith made a vast range of carburetters with a wide range of variants of each model to meet the demands of engine manufacturers. There were over a dozen different versions of the 30VE1. Each with different Choke and Jet sizes and even internal drilled passages. The best way to identify the correct carb. is by checking the ‘Contract Sheet’ number usually stamped on the casting (Fuel supply lug). Graham Medcroft added that – in addition to those listed above – the 30VE1 number for the 1936-38 Standard 10hp A10 was F1200. 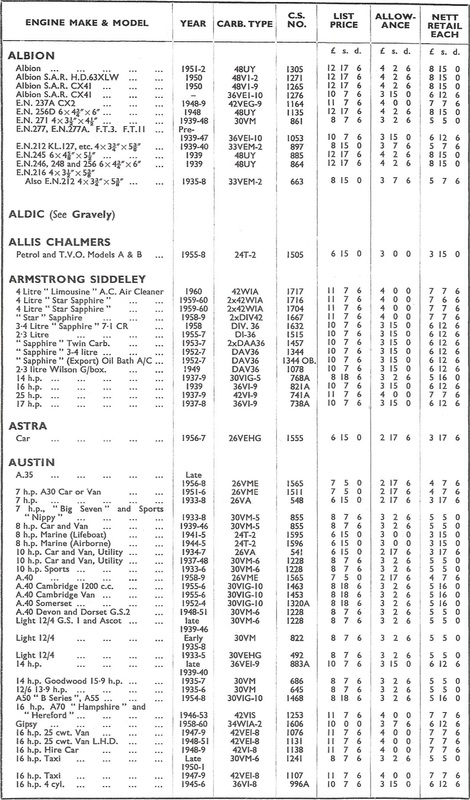 See also his 1955 Conversion Oufit sheet (cream) below for further VE1 variants that may be over 23mm choke size. He also identified that the very late Nippy was fitted with a 30VM5 number C855; this Zenith sheet from 1961 shows that the model was supplied for replacements, presumably after the VE1 was discontinued. It is also interesting that this model has a choke of 19mm, much nearer the ideal dimension – presumably to cater for the later Nippies with both sports and standard engines. 19 70 75 better acc/hills? 21 100 55 YE9 valve burning? 21, 100, 50 (as Martin Eyre’s Simplicity) goes very well and returns 40 mpg. Zenith – The A7 side draught or Ford 8 downdraught were popular carbs on tuned engines. The 17mm fixed choke in the side draught is too small for a higher revving engine, the 19mm of the Ford 8 works well with a combination of bottom end traction without restricting revs. Smaller venturi chokes can be machined out to the size you want. Its best to re-machine the venturi shape back in but they do work if just drilled through parallel. Beware that you’ve got the right size carb, the Austin 10 or the Ford 10HP engine had similar looking carbs with a bigger choke, the venturi size is cast or stamped into the top of it. If you’re not sure—measure it, try various sized sockets or other round things down the hole till one just slides through then measure its diameter in millimetres. Austin carbs usually have A7 or A10 stamped onto the mounting flange as well. For tuned engines, main jets around 70 or 75 and compensating jets around 65 or 70 will not be far out. The main jet affects the mixture at full throttle and at revs, the compensating adjusts the mixture at part throttle running, pick up etc. Generally if you go up on main jet size you can reduce the compensator size and vice versa. A range of jet sizes are available from Zenith specialists, standard sizes are in multiples of ‘5’. You can get in between sizes from carbs for production runs of a standard model. The number relates to the metric size, 75 is 0.75mm, with the range of modellers drills available you may be able to drill out your own – make sure you re-stamp the sizes! If it’s running OK leave well alone. Clean up with thinners to degrease. Then use the correct size screw drivers and spanners only and try leaving the carb to soak in paraffin for a week. Try warming the carb up by pouring hot water over it. Most of the early carbs nuts/bolts are BSW. Setting the float levels on early Zeniths can be difficult but it does pay to get it right. Bottom feed float chambers with the needle and toggles, these are the usual areas for concern. Try turning the toggles over to the unworn side. It won’t help if more washers are put under the needle seating in the hope that this will stop flooding because too large or too many washers will effect the float level causing weak mixture or flooding. Bear in mind to that the heat from the engine will sink in to the carb and expand the fuel, causing it to flood even when the engine is turned off . See these below for determining the C.S numbers needed. Here is a diagram with generic part descriptions; note main jets are smaller than the compensating jet. Burlen Ltd. 01722 412 500; they are the Zenith Carb. Co and the best source of spares. Any corrections or suggested additions – please make contact.